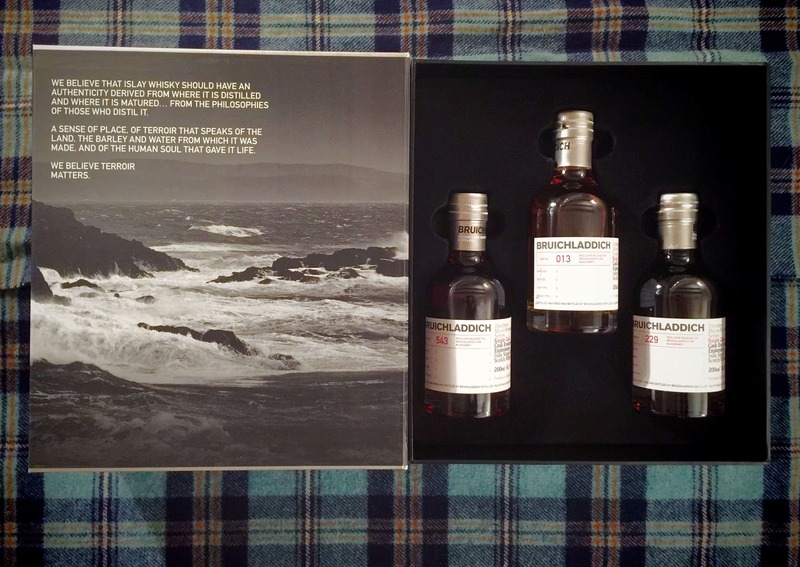 I feel I should always preface my Bruichladdich reviews with the fact that: yes, you know I like this distillery very much. (Just read about my wonderful distillery visit.) I even have a Bruichladdich fleece, scarf, tasting glass, badge and hip-flask. Yes, I am that fan. So with all that in mind, I’ll not bother with the pre-amble about the heritage and history of the distillery and get straight to the point. 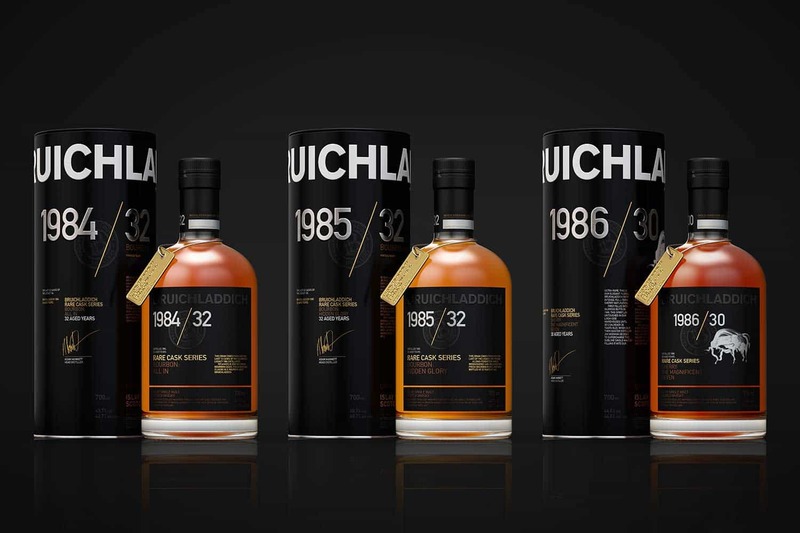 Bruichladdich’s more recent history has seen them become great experimenters, unafraid to try new and curious things. The Micro-Provenance Series is where you can see some of this experimentation in action. One of the best things about this range is that you can see, on the Laddie bottle itself, so much whisky data. Does it matter to the taste? Clearly not. But the geek in me gets a thrill by just knowing the cask, the barley type, the warehouse the whisky was stored in. I don’t care how old the whisky is; young or old I can love ’em all. And though I’d happily gauge my eyes out with a broken Glencairn if I so much as see another opinion on No Age Statement whiskies, I must confess it’s nice to know all this. It’s refreshingly honest. I can’t help but feel all warm and fuzzy to know for certain that the whisky was distilled on the first new moon of Aquarius, when the wind was coming from the east and the stillman had a dodgy tummy and a hangover from binging on a curry the night before. This information is glorious. This is the precise reason why I purchased another bottle from this series. I like the distillery and I want to explore its expressions in more detail. 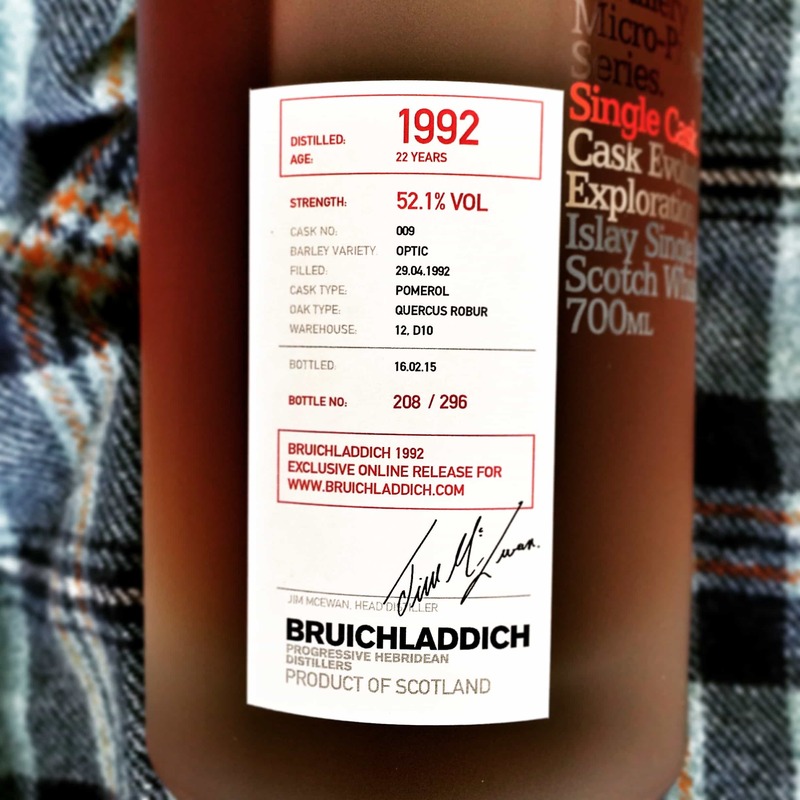 Though there are a few different whiskies available in the range, I opted for Bruichladdich Micro-Provenance Series Cask #009 – 1992 Pomerol. Pomerol being one of the great Bordeaux regions, producing a much sought-after red wine. 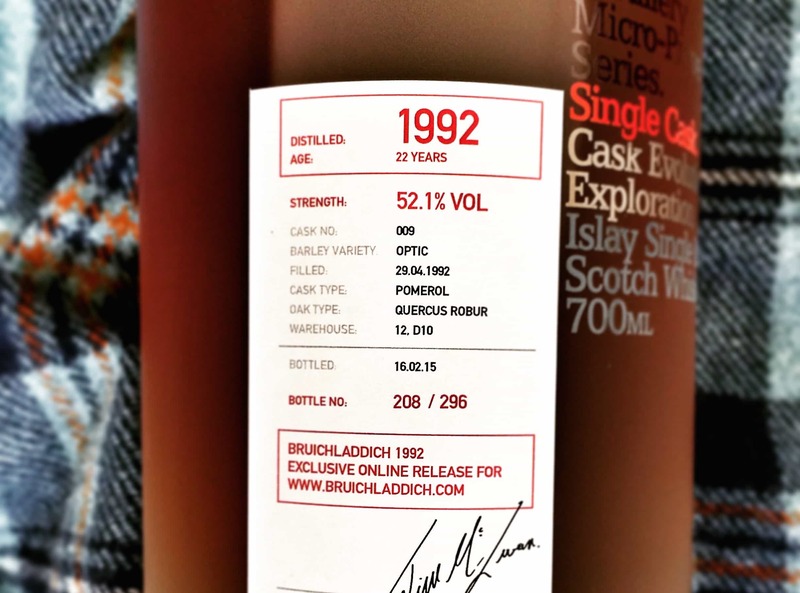 You can see from the picture of the label that this was distilled from optic barley in 1992 (filled on April 29th), stored in warehouse 12, D10 (whatever that means) and bottled in 2015 (February 16th) at 56.1% ABV, making it around 23 years old (though presumably it hasn’t spent all its life in there?). A bottle cost around £90, which strikes me as great value for a whisky of this age. Colour: russet, Oloroso sherry. On the nose: most unusual and delicate. Honey on toasted brown bread. Redcurrants. Blackcurrant leaves when rubbed between your fingers. Elderflower cordial. Beyond I’m starting to detect traces of old wood, pencil boxes and the likes, but they’re not up in your face. It’s stately stuff. In the mouth: Not at all a typical Bruichladdich at all, to my mind, but incredibly fascinating stuff. A balance is struck between unusual fruits – grape-juice, a russet apple – and wisps of brine. Honey, Seville orange marmalade, praline maybe. Walnuts. No citrus, but certainly a zip of something acidic in here, with wood tannins coming through on the finish. And in fact, an extremely warming chilli-pepper that follows. There’s something remarkably relaxing about this whisky. It’s mellow. It’s like a velvet glove. Lovely stuff. I keep thinking about this 1992 Pomerol Laddie. 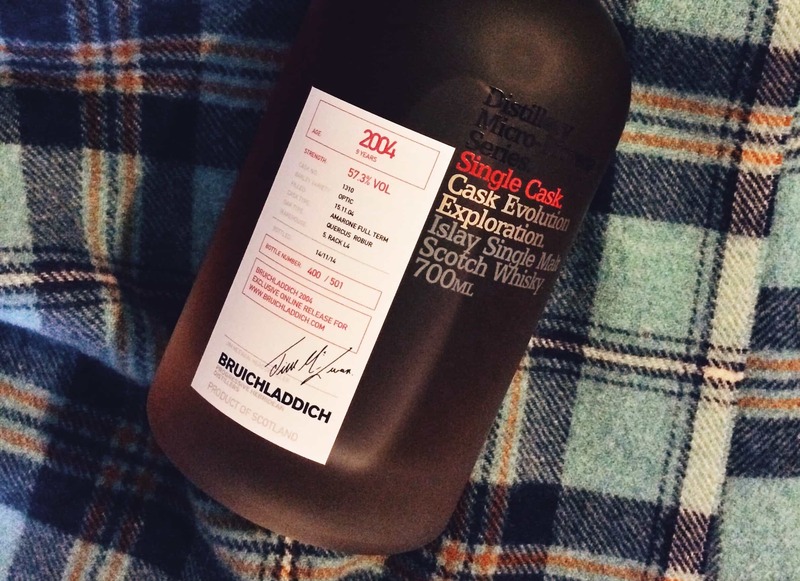 Hand this to someone and they’d have no idea it’s from Islay, no idea it’s a Bruichladdich. They’d be reminded far more of Speyside. There’s a regional dissonance that’s hard to come to terms with. It does not compute. Which, in a way, makes the Micro-Provenance series all the more interesting. Isn’t it fun to be bowled a googly now and then? I’ve said it before: I wish more distilleries did online only limited edition whiskies like this, and I wish more distilleries were this open about what influenced their whiskies. Fabulous. I love that place too, although managed to escape without all the fan gear (did spot Jim at a distance briefly though, so now my life’s complete!). One question that’s been bothering me for a while and I’m not blonde, but here goes: how can anything pre-2000 be associated with current management? Your bottle here is a prime example, being bottled in 1992: the Pomerol surely wasn’t the brainchild of a pre-McEwan distiller?? This is where I find trouble reconciling the ‘Progressive Hebridean Distillers’ with anything pre-2000, unless an old distillation has been ‘finished’ in experimental casks. Hi Jude. You know, that’s a very good question. The data doesn’t tell me that! I would side with you in that this must be either transferred to Pomerol at some point, or there was wine-casks at the distillery in 92. The distillery was closed from 1994, so if the former it’s spent a decade what was most probably bourbon before being transferred. Thing is, these folk aren’t shy about saying things are or aren’t finished. The website description simple says that it has matured in these casks, though doesn’t specify a time.